[General description] Looking north along Gawler Place towards the rear of the Oriental Hotel, which is situated on Rundle Street. Shops on the right are soon to be demolished and replaced by a new building named Claridge House. [On back of photograph] 'Acre 82 / Gawler Place, east side / Feb. 28,1926 / Shakespeare's premises and the two storey buildings next door north were demolished in 1926. For view of the building subsequently erected see B 4712, B 4839, B 4840. Near side of three storey building on left is 33 yards south of Rundle Street. 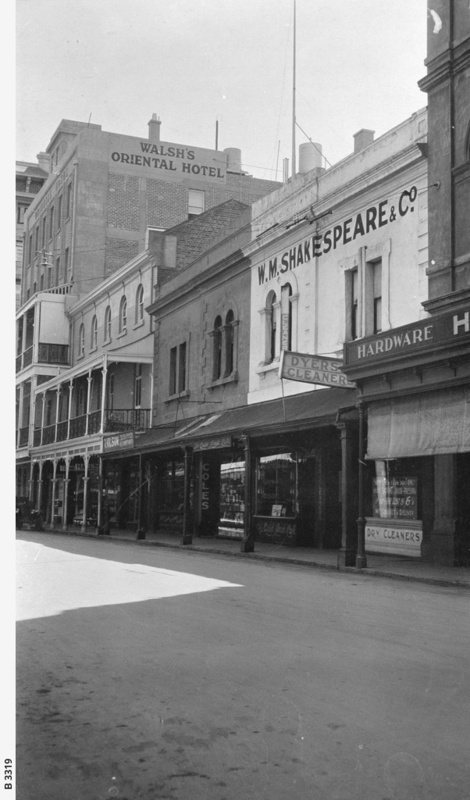 Near side of Shakespeare's is 53 1/2 yards south of Rundle Street.' (Another hand) 'For better view of Oriental Hotel buildings see B 7483'.